Our Island is located on the beautiful Lake of the Woods, Ontario Canada. It is situated approximately three miles west of Kenora. It is a private four acre island and a newly remodeled cottage with a full wrap-around deck sitting above the boathouse. The upstairs cabin has two bedrooms with a queen bed in each. There is also a bunk room with 4 beds (5 feet in length). There is a downstairs boathouse room with a queen bed and two sets of bunk beds. We do not provide a boat, so you will need your own, or rent one as it is an island. The Big Blue may be available for a monthly rental rate. Various weeks/months are available. Please check the calendar. Please call or email if you have questions! My sisters and I own this lovely place. Our parents purchased it in 1967 and we have spent many summers here. It's the best place on earth! My sisters and I grew up spending summers at this magical place. We loved it so much that we decided to update it and we have been really happy with how it turned out. We love every minute we get to spend here, and love to let others enjoy it as well. If you have never spent the night in a boathouse, then you are in for a treat. You can hear the water below as the boats move around. Storms are a great experience here as they come up very fast and hard, then slowly go away. Hot days are wonderful as your stay is spent mostly above the water on the circular deck that surrounds the cabin, or down below just inches from the water. Feel free to walk the trail that goes around the whole Island. The whole property is waterfront. The cabin is out over the water and one can walk around the whole property and be 'waterfront'. The property is on a private island with a boathouse, There is covered boat parking in the boathouse, when you rent the place you get the whole island to yourself. You will need a boat as it is an island and we do not provide one. It was a lot of fun at the boathouse. Also very amazing that they had so many beds available. Page, one of the owner was very good and answered all our questions, even though sometimes it took a while for her to respond. It was great to have canoes and a paddle boat available. We sure did use those. The fire pit was great too. We loved our stay. It was really great. We were a bit disappointed about the cleanliness of the place when we arrived. A lot of dust, spiderwebs and smeary mirrors. We are so glad you had a great time! Thank you for letting us know about your issues - we will take steps to make sure those things are corrected. We loved the Big Blue! We have rented a number of places on Lake of the Woods over the years and the Big Blue is definitely our favourite. We couldn't have asked for a more convenient location. Very well equipped and well thought out cabin. Definitely not lacking for anything. Our young kids loved the bunk beds, playing in the loft and challenging themselves to jump off the deck. My wife and I loved relaxing mornings with coffee and the great view. We caught an amazing lightning storm one night and it was great watching the light show from above knowing that our boat was perfectly safe and protected down below. We had a great time star gazing, swimming, canoeing, water skiing, tubing, fishing and visiting with friends on the lake - and all in 5 days. Just imagine what we could do with a longer vacation at the Big Blue. One of our best vacations on Lake of the Woods (other than being too short). Thanks Big Blue! Sounds like you folks know how to do vacations right! So glad you chose our island, and hope you return again! You were great guests! I really appreciate that dogs are allowed as our two boys enjoyed having so much freedom to run around and it was a joy to see. Bring fishing kits, board games (though they have some there, thank you!) and some outdoor games as there is a large park area perfect for badminton, soccer, etc. I would also definitely recommend exploring and going to Kenora and Keewatin for breakfast in the morning and drinks at night! We are so happy that you had a great time! You and your family are welcome back anytime! The island is a very special place! We spent 7 great days at the Boathouse in June of 2015. Not our first visit to this beautiful lake but our first time at the Boathouse. We were very happy with the accommodations. The entire trip, payment, facilities, etc. was very nice. We arrived to find everything in excellent condition. The living area is updated, clean, comfortable and everything worked just fine the entire week. Kitchen was well stocked with all utensils, dishes and appliances. Beds and linens were clean, comfortable and well maintained. The deck was huge and well stocked with lounges, chairs, tables, etc. The boathouse was very roomy and super nice to pull into at the end of the day. I am particularly grateful that a place like this is available for rent and I appreciate the owners keeping it in such great shape for many to enjoy. We will stay here again! I highly recommend for families and groups large and small. We are so happy that you enjoyed our island so much! We really love it there too, and want others to experience it! You were wonderful, respectful guests and are welcomed back any time! 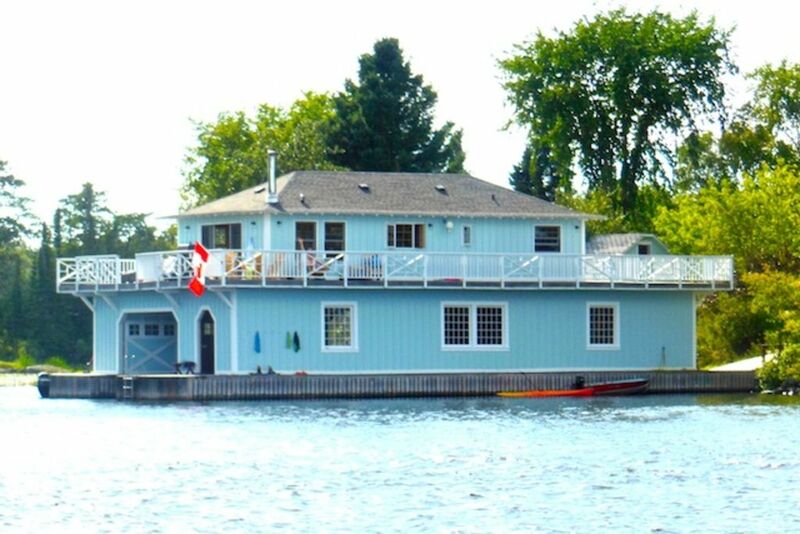 I rented the boathouse for two nights with some friends this May. Upon entering, I realised the pictures didn't do the rental justice. A lot of the upgrades look to have been done recently and very well. We had a bonfire both nights, the pit is at the point of the island and all of the town lights can be seen at night from here. Some of my local friends commented that it was the best fire pit on the lake! All of the guests were comfortable and it was nice to see that previous guests had left things behind for future visitors. Don't be scared off if you have land lubber visitors with no boat, it took us longer to untie the boat than it did to drive to the Keewatin beach dock to pick up guests. We will be making our next reservation for this place sooner than later! We are so happy that you loved our island and had a great time! We hope to see you next year! The Big Blue Boathouse was even better then we imagined it would be! Had an awesome weekend and looking forward to returning. The cabin was in excellent condition and fully stocked with all of the essentials. The wrap around deck had an amazing view and there was lots of great fishing near by! Glad you had a great time and great fishing! Thanks for the picture of the huge fish you caught! You will need to bring your own boat or rent one as our place is an Island. We have a canoe and paddle boat there for adventure around this great setting.